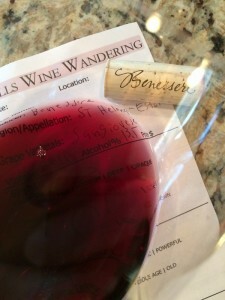 In celebration of the 20th Anniversary of Benessere Vineyards, the Benish family has assembled a memorable Wine Country week for up to ten adults. Lodging is provided with a six night/seven-day stay in our four-bedroom, four-bath country home that features a full kitchen (stocked with Benessere wines of multiple vintages, of course! ), outdoor fireplace, tennis court and much more. You and your guests will enjoy gorgeous views of the surrounding vineyards and hillsides from the wrap-around porch. During your stay, winemaker Matt Reid will lead the group in a blending session of your own 2013 version of our flagship Tuscan red blend, “Phenomenon.” As a memento of your stay, each guest will take home a bottle of your unique blend! 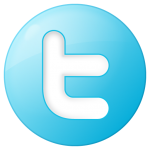 To be scheduled on a mutually agreed upon date between June 2014 and May 2015. I talked with our friend Ralph and we decided to start bidding on the package. Since we were planning another trip to Napa in 2015, we figured if we won the bid we could bring some additional friends with. The bid period was multiple days that ended on a Sunday. Our strategy was not to bid continuously, but to enter a bid at the end of each day. There were many bidders and the bidding started and stopped throughout the day. We could see there were two contenders for this package including us. The bidding ended on Sunday June 8th; whereas we did not win the bid. The winning bid was $8,150.00, Ralph and I felt that was too high. A few months after the Napa Valley Auction was over I received a letter in the mail from Benessere thanking me for the support while offering us a free cheese and wine pairing and tasting. Chris and I were scheduled for Napa in October so I scheduled the tasting with Alex; the Manager of Sales and Hospitality. As Alex and I communicated he also mentioned a harvest party that was to be held the same weekend that we would be in Napa. We arrived at Benessere for our tasting and enjoyed it. Their wines are great and affordable. Towards the end of the tasting Alex again asked if we would like to attend the harvest party and we decided to join. The grape stomp and the entire party was a blast. During the stomp portion of the party there were three teams (red, white, blue) of ten. We and two other friends were a part of the white team who won the stomp by half of a pound. There were 10 participants on each team and each player of us was given a three pack of wines! We received a Pinot Grigio, Sangiovese, and a Zinfandel. Medium color depth, ruby hue. The Sangiovese was very aromatic. Development was young-fruity with aromas of red cherry, red current, vanilla. Dry, medium-bodied with balanced acidity. Rich mid-palate flavors with a savory long finish. How much: $35.00 on the website. 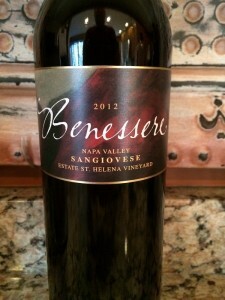 I rated the 2012 Benessere Vineyards Sangiovese three glasses.